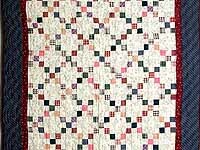 A wonderful small quilt with an abundance of patchwork (note how perfect and narrow the 1/2 inch pieces are!). 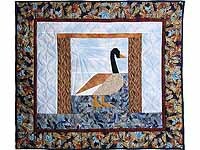 This quilt can be used as a wall hanging or as a table covering. 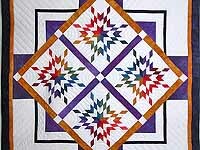 Signed and dated by Lancaster's renowned quilt designer C Jean Horst. Very well made. 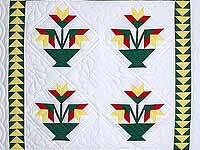 quilted by an Amish woman in her home. A very traditional design with lovely rose and blue fabrics. Note the embroidery along the edge of fan and the care taken with the piecing. Nicely quilted! Made by Lancaster Amish woman in her home. Includes a sleeve for a hanging rod. 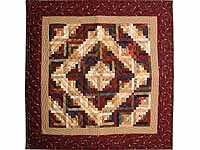 Lovely little quilt with extraordinary workmanship! 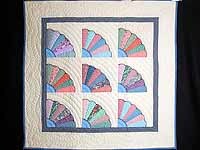 Lots of great quilting, special patchwork border and sash, very fine quilting, and precise patchwork piecing. Hannah specially selected the fabrics. A quilt that will cherished for generations. Made in Lancaster by an Amish woman. Includes a sleeve for a hanging rod. Special coloring with soft cranberry tones. 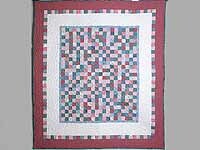 A lovely quilt for a crib or as sofa throw. Nicely made by local Amish woman, note the abundance of quilting. BIG and Colorful! Excellent patchwork piecing. All the colored fabrics were hand dyed. Note the care taken with the quilting design and the stitching. A superior quilt. Initialed and dated by its local Amish maker. Includes a sleeve for a hanging rod. We love this pineapple patchwork design! Rarely available as a wall hanging. Superior fabric selection. Well made by Amish woman in her home. 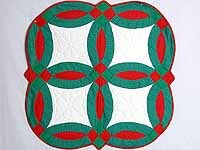 Delightful small quilt to brighten your Christmas decor. Nicely made in Lancaster by an Amish woman. 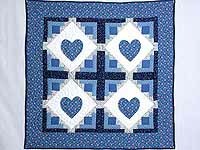 What a beautiful classic pattern for a crib quilt! It would work well as a sofa throw or wall hanging too. 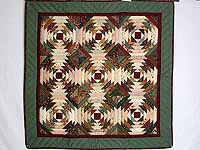 Plaids always seem to give quilts, such as this one, a splash of vitality. Note the attractive border print. Well made by local Amish woman -- note how well the quilting and piecing are done. There is a sleeve for a hanging rod.